These images are courtesy of Dolphin Neurostim, inventors of MPS technology. 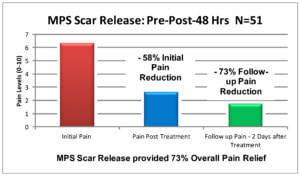 According to their research, "After a single scar release application, MPS improved pain outcomes 73% on severely chronic pain patients, who suffered an average 7.61 years with an average intensity of 6.33/10"
Scars can put pressure on pain sensitive structures, limit joint movement, and restrict flow through the body. Many patients even avoid touching their scars because it is so disconcerting. 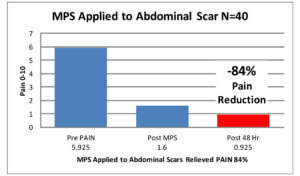 Releasing this restriction not only benefits the area of the scar itself but can improve connection throughout the whole body.